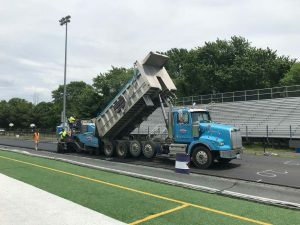 The Chantilly High School track is getting a facelift! After our crews removed the rubber track surface and milled off the old, underlying pavement, one of our paving crews mobilized on-site and utilized laser automation to precisely install a beautiful mat of asphalt pavement. Beynon Sports Surfaces, the project’s general contractor, will finish the job by installing the new, high-performance, synthetic athletic surface. Ruston Paving is proud to partner with Beynon on yet another project. There is no doubt Beynon makes fast look good!